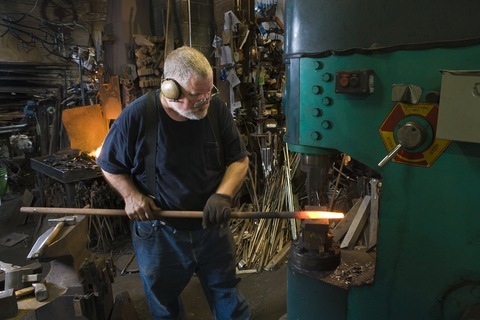 Photo of an artisan blacksmith by John Burke via Getty Images. Paul Solman: We write a lot about Social Security on this page. Recently, our resident expert “Ask Larry” Kotlikoff and I got into a tiff about ways to make the program solvent. One of the possible fixes I mentioned was extending the retirement age, which I reported on at length some years ago. Just last week, however, Jared Bernstein weighed in on Social Security solvency and did not include age extension among his suggestions. Here is another take on Social Security, this time from Teresa Ghilarducci, the Irene and Bernard L. Schwartz Chair of Economic Policy Analysis and director of the Schwartz Center for Economic Policy Analysis in the Department of Economics at The New School in New York. Her 2008 book, “When I’m Sixty-Four: The Plot against Pensions and the Plan to Save Them,” attracted considerable attention, as did its proposal to create a mandatory government-run savings plan to which workers and employers would supplement their Social Security pension by contributing an additional 2.5 percent payroll tax. Teresa Ghilarducci: Two memorable signs at the Jon Stewart and Steven Colbert Washington, D.C., rally in 2010 called for a better America: “Tights are not Pants” and “What do we want? Evidence-based policy. When do we want it? Now!” Of the two protests — one on fashion and the other on policy reform processes — the latter deserves close attention. The ever-present, but very unpopular, policy proposal to raise the age to collect full Social Security benefits from to 67 to 69 or 70 — which cuts lifetime benefits for all recipients, especially for those who have shorter life expectancies and collect Social Security well before age 67 — needs to be based on evidence. Unfortunately, there is a commonly-held belief that the physical and mental demands of older workers’ jobs have improved. The evidence, however shows that belief to be wrong. The truth is the exact opposite; the physical and mental demands of older workers’ jobs have increased since 1992. Anthony Bonen, a graduate research assistant in our Schwartz Center for Economic Policy Analysis at The New School, recently presented numbers from the University of Michigan’s Health and Retirement Study to show the degradation in job quality for older Americans from 1992-2008. The shocking fact is that jobs for older Americans have gotten more mentally and physically difficult. This is actually quite consistent, however, with a gradual decline in older workers’ bargaining power, as evidenced by falling older worker pay and increasing long-term unemployment rates. New York Times reporters Steve Greenhouse and Michael Barbaro revealed an embarrassing internal memo to Wal-Mart’s board of directors in 2005 that revealed the corporation’s motives and methods to make work harder for older workers. The leaked Wal-Mart memo “proposes numerous ways to hold down spending on health care and other benefits” by ensuring every job required physical tasks — stocking shelves, gathering carts — which should discourage unhealthy and older workers from obtaining and/or retaining employment at the retailer. And not all physical toil involves “lifting.” From 1992 to 2008, the proportion of jobs requiring ‘good eyesight’ increased by about 30 percent for workers aged 50-61, and a huge 79 percent increase in the share of jobs that require good eyesight for the oldest group (age 62 to 65). Admittedly, there was a slight improvement in the physical demands of work for young and middle-older workers — an approximately 10 percent fall in the proportion of jobs that require ‘lots of physical effort’ ‘all of the time’ from 1992 to 2008. But across all American workers, that effect has been overwhelmed by more heavy lifting. What’s happening? you may wonder. Haven’t traditional shop floor, blue collar manufacturing jobs decreased and the heavy lifting along with them? Yes, but the big secret is that ever-more-demanding service jobs have taken their place. The implications of the data should be clear: in their on-going fiscal policy negotiations, lawmakers should not raise the Social Security and Medicare eligibility age. Evidence shows that many older workers are simply not able to work past traditional retirement age without substantial suffering. Reducing their retirement income and throwing them off medical insurance will create a new cohort of impoverished elderly, reversing the tangible gains in reducing old age poverty made since the Great Depression. Is there a way to distinguish between workers who need to retire “on time” — about age 67 or earlier — and those, like a television reporter, college teacher, or a comfortable Senator — who could work longer? There is no possible rule government could administer to distinguish those who could or could not work. Some older workers may like their jobs and be fortunate to have employers who like them. They should certainly be able to work. Policy makers should not cut Social Security benefits wrongly thinking that jobs are getting easier and old people can easily find and keep work. Cutting Social Security, Medicare and/or Medicaid benefits is terrible public policy because senior citizens who can least afford it will be the most grievously hurt.